“My heart aches and a drowsy numbness dulls my sense, as though of hemlock I had drunk…” My junior year of high school I read “Ode to a Nightingale” for the first time, and whenever I feel particularly overwhelmed with the futility of a situation, this line echoes in my mind. After this week’s episode my heart truly did ache and it had nothing to do with the unsavory exeunt. But we’ll touch on that again later. Steven: What are we to make of Boyd’s dispatching with Daryl? Daryl: That was cool as ice. And have we mentioned how much we hate Daryl’s accent? Boyd: I’ve been accused of being a lot of things, but inarticulate ain’t one of them. I’m kind of done with Daryl. Aren’t there actors in Hollywood who, you know, have actually been to the South? As sad as I was to see Jean Baptiste get blown away with a shotgun, it does mean that Daryl (or should I say Dare-roll-lla?) is one step closer to being gone. Still, Dewey hasn’t taken any actions toward that end, I mean, besides giving away his prized turtle dog to one of his whores. I know that we’re supposed to believe that Boyd’s threat is practically legally binding and this his pressure or actions will be enough to drive Daryl out, but I also think that would be an easy way out. So that leaves Raylan and Dewey. I somehow doubt–though I hope and hope–that Dewey will grow sufficient spine or brain to successfully take out Daryl. So that leaves Raylan. But wouldn’t that be too easy? My prediction for Daryl is this: We will have a new antagonist soon. Last season at episode 5, we had no idea where we would end up or why and I expect nothing less of Graham and the boys this season. Also, what do we think Wendy and Daryl mean by “the old thing”? I’m still on the edge of my seat with curiosity. Susan: A new antagonist would be excellent, because I just can’t handle Daryl and his “accent” much longer. However, I love me some Wendy, so whatever it is she means by “the old thing” is a-okay with me. Also, seeing her in a scene with the blonde social worker further highlights how inadequate she is as a love interest for Raylan. Now Wendy is a REAL Elmore Leonard kind of woman, deserving of a man like Raylan. More of her, please. Steven: This probably just shows my gross ignorance, but how does putting away Theo Tonin change the show’s dynamics? 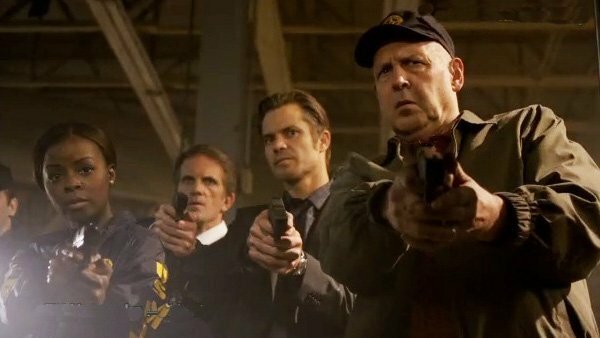 It provides us with that great, tension-dripping scene between Art and Raylan, which closes out the episode, but I have no idea how it will filter out through the various criminals and law men of Justified. I much appreciate the new plot turn it has allowed for Raylan to come clean with Art finally after half a season’s worth of suspicion, and I’m glad Art gets to go out on top, but besides the toasting and cigars, I really don’t know how it will affect the show. Theo hasn’t had a terribly involved role in Kentucky. Not like Boyd or Wynn Duffy. It makes me wonder if this whole take down was just a way to put the right pieces in Art’s hands and make Raylan confess. Speaking of the tarmac, what has once again become of Winona and Raylan’s baby girl? I know that Natalie Zea is on another show and that the lives of babyies aren’t exactly rife with hillbilly criminal endeavors, but can you blame me for wondering about Raylan’s family-front? Susan: The Theo story is peculiar, but more than anything, it makes me worry about Art’s life on this show. What more is there? He’s figured out Raylan, he’s taken down Theo, and Vasquez mentioned that he’s 8 months away from a happy retirement. That, plus the mention of him needing to spend some time at the shooting range makes me feel like his time is just about up. But boy, all his scenes with Alan Tudyk were great, weren’t they? So much more tension than anything Daryl has produced this season. I loved seeing him interact with Wynn and Mikey too. Art goes with everything. Speaking of Alan Tudyk – now there’s a slam dunk Elmore Leonard casting choice. They really have a handle on those Detroit characters. Steven: How much do we ache for Ava and Boyd? Truly he has done some evil things, but haven’t they been to some of the most corrupt law men in Harlan? Haven’t they been justified? Then why has the narrative conspired against him and Ava so cruelly this episode? I don’t even want to know what’s in store for Ava at the hands of 4-foot Doyle the prison guard. I feel like the only logical direction for them to take is a prison break, but that would mean Boyd leaves the show for good. The only alternative I can see is a tragic end for both Ava and Boyd. And I don’t like it one bit! Susan: The Ava bit was dreadful, especially because you could see it coming from a mile away and there was nothing to do but sit and wait for the inevitable punch to the heart. Here’s the thing though: couldn’t Raylan or any half-wit lawyer clear Ava’s name? I mean, she’s already protected, so the other guards could turn on Doyle or make Ava’s cell mate a sweeter deal so that she’d recant her statement. It can’t be that hard. Then again, I don’t really know prison politics all that well, so maybe not. Either way, it does seem needless to keep them apart again, unless the show doesn’t know what else to do with Boyd + Ava = True Love 4ever. This was the first episode though, where I really started to see what the darkness has done to Boyd. His handling of Paxton is brutal and excessive and uncharacteristic. Then he follows it up by hiring a sick man to walk into a diner in the middle of the day and shoot the Sheriff point blank, right next to Mara to prove a point? It was chilling, and, as Daryl says, cool as ice. Boyd without his lady, without his cousin, in the black tar business is not the lovable scoundrel we’ve come to know. This is a whole new kind of monster. Could Boyd finally be our antagonist after all? Haitian hamburger. The kill shot was cartoonish, but everything leading up to it was uncomfortable and uncertain. I had no idea what to expect from beginning to end, but I understood every beat of those three characters in that scene without any dialogue or backstory. How can those three be so clear while Daryl and Wendy are still mysteries? I was happy to see that Johnny has finally learned a thing or two and was able to turn Hot Rod’s men against him. Though his money hasn’t bought him enough respect to allow him to talk about affirmative action at the card table. That was a nice Justified touch. Is Detroit done forever now that Theo is dead and the Canadian connection is over? What does that mean for Wynn and Mikey? Will they just stay in Kentucky and be their own bosses? Does that suit them at all? I’m going to miss those Detroit side stories. And what about Picker?